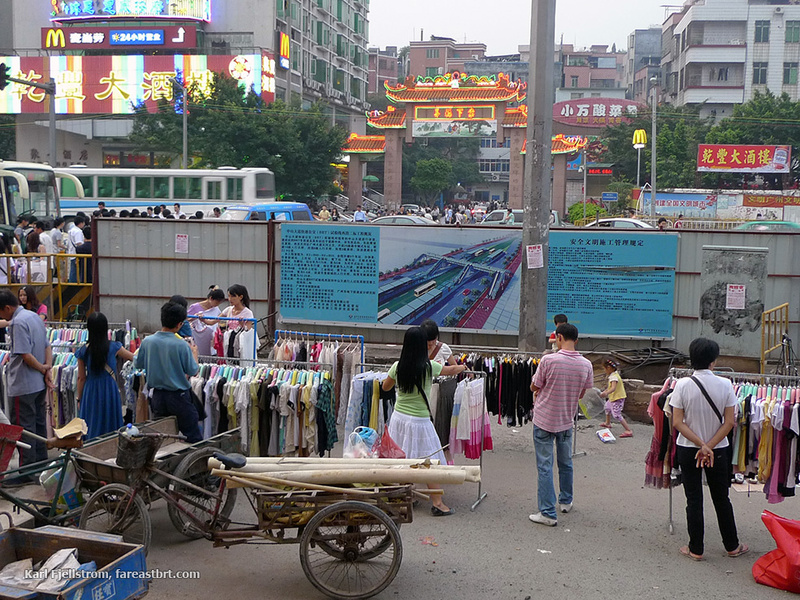 Guangzhou's so-called urban villages (cheng zhongcun, 城中村) are extremely dense, mixed use, car-free settlements that proliferated especially since the 1980s. Typically 8 or even 10 storey sub-standard buildings were built on the former agricultural land surrounding historical core villages, becoming home to lower income recent migrants and greatly expanding the original village’s physical coverage and population. Many urban villages are being upgraded, while others are being demolished and replaced with high-rise housing. Guangzhou has more than 100 urban villages, and 20 are located along and around the BRT corridor. Given the general absence of roads wide enough to accommodate motor vehicles in the villages and the ban on motorcycles in Guangzhou, residents of the urban villages rely on public transport for longer trips. Tangxia is one of the larger urban villages in Guangzhou, with an estimated population of 40,000 people in an area of less than 0.5 square kilometres; a population density of more than 80,000 people per square kilometre. Tangxia is located around one-third of the way along the BRT corridor, around 10km from the city centre. ITDP carried out a survey on Friday 12 September 2014 to verify the anecdotal observation that a large proportion of urban village residents use (and benefit from) the Guangzhou BRT system to access jobs and opportunities in the city centre. Tangxia BRT station is one of the most heavily used BRT stations in the world, with around 8,000 boarding passengers per hour in the peak hour. During the morning peak period, from 7am to 9am, with data recorded at 5 minute intervals, counts were made of all people exiting the Tangxia village gate. (Tangxia village only has one gateway in the area near the BRT station, making counting easier, and the escalator access to the BRT means most people likely entered via the closer bridge access rather than the street-level access 50m further away.) Counts were also carried out of all people walking down to the BRT platform from the Tangxia village direction on the BRT bridge. The count locations are shown below. From 7am-8am the proportion of people exiting the village who then entered the BRT station was even higher - around 80%. The results showed that reliance on the BRT by urban village residents was even higher than expected. Of all the people walking out of the Tangxia village gate in the 7am-9am morning peak, fully 70% entered the BRT station and hence used BRT buses. From 7am-8am the proportion of people exiting the village who then entered the BRT station was even higher - around 80%. (Furthermore some of the urban village residents will have preferred to walk an extra 50m to the street level crossing to the BRT station, avoiding the need to use the escalator and then walk down stairs to the station platform, so the actual percentage of urban village residents using the BRT system in the morning peak hour is probably even higher than these survey results indicate.) In conclusion, the survey results confirmed the anecdotal impression that the BRT is heavily used and relied upon for access to jobs and opportunities by the residents of the urban villages along the BRT corridor. See also: Urban village regeneration along Guangzhou BRT corridor. Conditions for bus passengers at Tangxia Village before the BRT. Conditions for bus passengers at Tangxia with the BRT have been greatly improved. Tangxia gate in June 2009, with the BRT station under construction and station rendering on display in the foreground. 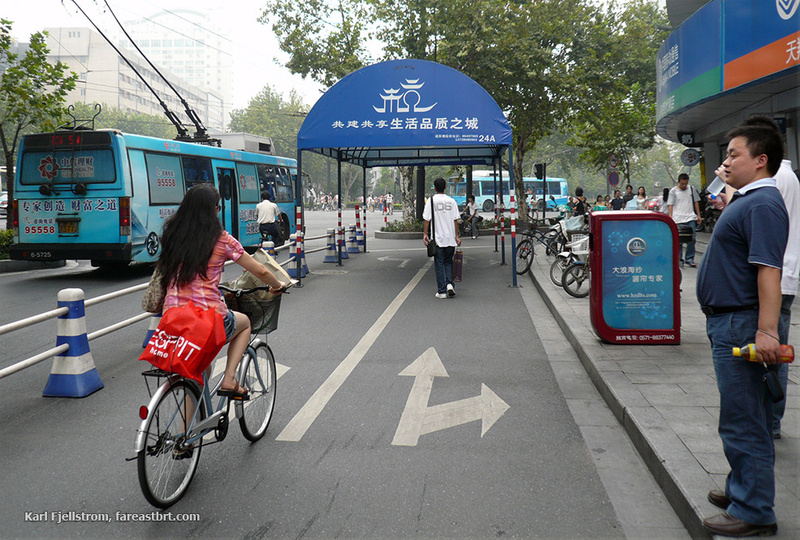 The BRT has greatly benefited tens of thousands of Tangxia residents.